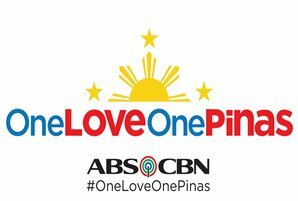 ABS-CBN joins the PasaLord Prayer Movement in calling on Filipinos of every creed and denomination to pray for our country in the first nationwide synchronized moment of prayer tomorrow, Thursday (February 7) at 12 noon. Dubbed “Prayer for Peace in the Philippines,” the activity aims to have every Filipino pray for lasting peace in the nation at the same time and from wherever they are. “Imagine the whole Philippines pausing for a minute or two to lift our leaders, our families and our country up to God. Never before has our nation or any country in the world stopped to do precisely that,” said PasaLord Prayer Movement founder and lead convenor Lourdes “Bing” Ll. Pimentel. 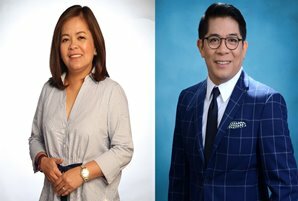 Different programs on ABS-CBN’s multiple media platforms such as noontime show “It’s Showtime” and several DZMM TeleRadyo shows have begun inviting the millions of Kapamilya viewers and listeners to take part in the historic event, which also has the support of the three branches of the government. “The President has agreed to pray. So have the Senate President and the Chief Justice who are mobilizing their respective departments to take part in this activity. We have also invited the VP, the Senators, the Speaker, members of the Congress, the Justices, members of the Cabinet, leaders of the Armed Forces, heads of the academe, captains of industry, hospital administrators and members of the media and entertainment sectors. The response has been overwhelming,” Pimentel shared. The prayer, which has versions in English, Filipino, Cebuano, and Hiligaynon, takes about a minute to recite. 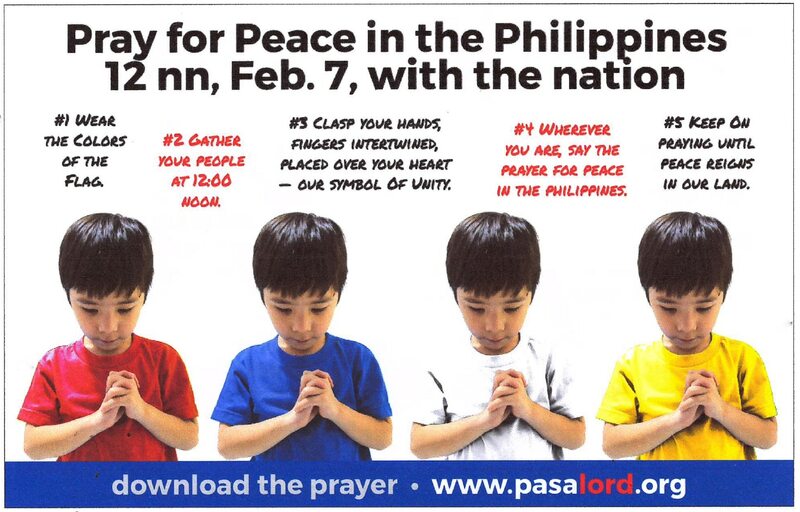 People are encouraged to wear the colors of the flag on Thursday (February 7), clasping their hands over their hearts with fingers intertwined as a symbol of unity as they pray. They also encourage people to share video clips and photos of the activity on social media with the hashtag #PasaLord. Pimentel hopes that even after the synchronized prayer event, Filipinos will continue to take a pause each day and recite the prayer until peace reigns in our land. 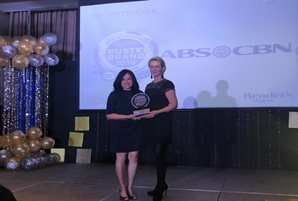 “Together we can change the spiritual climate of the Philippines so that the good we’ve been trying to do will have a better chance of success,” she ended. Almighty God, in Your mercy and compassion, forgive our sins and the sins of our people. Look with favor upon us as we pray for our country, the Philippines. Bless our leaders with wisdom, integrity, truthfulness and righteousness. Uphold our families and keep our children safe. Help us be upright and moral citizens, living together peacefully, with sincerity, loving-kindness, acceptance, tolerance and forgiveness. Protect us from foreign invasion and destructive influences, and defend us from acts of lawlessness, terrorism and war. 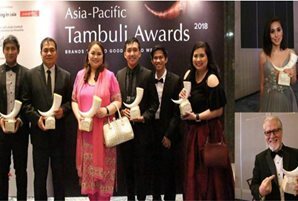 Grant our country peace, unity and prosperity, and bring about the transformation of our nation so that we may be Your light to Asia and the world. Amen. Join ABS-CBN and the PasaLord Prayer Movement in the first ever nationwide Prayer for Peace in the Philippines on Thursday (February 7) at 12 noon. For more information, visit https://pasalord.org. For updates, follow @ABSCBNPR on Facebook, Instagram, and Twitter or visit www.abscbnpr.com.